Light is an electromagnetic radiation of various wavelengths. Long wavelengths are red, the short ones are blue. Blue light is harmful during the night. This light of more than 4000 K, also known as neutral/cold white light, is the richest in blue wavelengths of 450-480 nanometers, yet it does not appear blue. It aids us in concentrating during the day hence is ideal for use during work or school. It is important to note that other commonly used warmer lights also contain blue wavelengths but of lower levels. Cell phones, tablets, computer screens, TV and electronic visual displays as such emit high amounts of blue wavelengths. As a consequence, they should be avoided 90 minutes before sleep or, alternatively, used with screens or eyewear with red filters that block blue wavelengths during this time. We should avoid being exposed to blue wavelengths prior to sleep to maintain proper melatonin secretion. It is suggested to avoid being exposed to blue wavelengths 90 minutes before sleep or, alternatively, 9.5 hours before waking up. If electronics with visual display screen need to be used during this time, using screen foils or eyewear with a red filters is necessary as the light's blue wavelengths will be filtered and hence will not reach our eyes. Light during the day is rich in all wavelengths including blue, however as the sun begins to set, blue wavelengths are filtered-out and the light is rich in red wavelengths – this is why we see the sun orange-red during sunset. The absence of blue wavelengths triggers the secretion of melatonin. Melatonin is a hormone that controls the daily night-day cycle, thereby allowing the entrainment of circadian rhythms. Simply, it makes us want to sleep, but not only that: it is also a powerful antioxidant and is believed to play a vital role in the immune system. Its secretion is inhibited by light's blue wavelengths and, conversely, is stimulated in the absence of these wavelengths. Melatonin plays a role of utmost importance in proper sleep and its decreased levels over longer periods of time lead to serious health problems, possibly including cancer as recent research suggests. The most underestimated health hazard is nocturnal light. In mammals, the pupillary light reflex is mediated by intrinsically photosensitive melanopsin-containing retinal ganglion cells that also receive input from rod– cone photoreceptors. To assess the relative contribution of melanopsin and rod– cone photoreceptors to the pupillary light reflex in humans, we compared pupillary light responses in normally sighted individuals (n  24) with a blind individual lacking rod– cone function. Here, we show that visual photoreceptors are required for normal pupillary responses to continuous light exposure at low irradiance levels, and for sustained pupillary constriction during exposure to light in the long-wavelength portion of the visual spectrum. Inthe absence of rod– conefunction, pupillomotor responses are slow and sustained, and cannottrackintermittent light stimuli, suggesting that rods/cones are required for encoding fast modulations in light intensity. In sighted individuals, pupillary constriction decreased monotonically for at least 30 min during exposureto continuous low-irradiance light, indicatingthat steady-state pupillary responses are an order of magnitude slower than previously reported. Exposure to low-irradiance intermittent green light (543 nm; 0.1– 4 Hz)for 30 min, which was givento activate cone photoreceptors repeatedly, elicited sustained pupillary constriction responses that were more than twice as great compared with exposure to continuous green light. Our findings demonstrate nonredundant roles for rod– cone photoreceptors and melanopsin in mediating pupillary responses to continuous light. Moreover, our results suggest that it might be possible to enhance nonvisual light responses to low-irradiance exposures by using intermittent light to activate cone photoreceptors repeatedly in humans. The pupillary light reflex (PLR) regulates the amount of light that reaches the retina. In doing so, the PLR optimizes visual acuity over a wide range of illuminance levels (Campbell and Gregory, 1960) and protects the retina from the potentially damaging effects of exposure to bright light. The PLR is mediated by melanopsin-containing retinal ganglion cells that project directly to the olivary pretectal nucleus (Hattar et al., 2002; Gooley et al., 2003). Melanopsin cells are intrinsically photosensitive and respond most strongly to short-wavelength light in the blue portion of the visual spectrum (Berson et al., 2002; Dacey et al., 2005). Rod– cone photoreceptors also provide input to melanopsin cells (Belenky et al., 2003; Wong et al., 2007), but melanopsin cells are not required for pattern-forming vision (Gu¨ler et al., 2008). In contrast, the PLR and other nonvisual light responses are abolished if rod– cone and melanopsin signaling pathways are disrupted simultaneously (Hattar et al., 2003; Panda et al., 2003), or if melanopsin cells are selectively killed (Gu¨ler et al., 2008). In humans, rods and cones are capable of driving the initial rapid constriction of the pupils in response to light (Alpern and Campbell, 1962), whereas the PLR is most sensitive to shortwavelength blue light during exposure to continuous light (Bouma, 1962; Alexandridis and Koeppe, 1969; Mure et al., 2009; McDougal and Gamlin, 2010), even in the absence of rod and cone function (Zaidi et al., 2007), suggesting a primary role for melanopsin photopigment. For light intensities below the threshold of activation for melanopsin cells, spectral responses of the PLR during exposure to continuous light are consistent with a role for rods, with little or no contribution from cones (McDougal and Gamlin, 2010). By comparison, attempts to isolate visual photoreceptor contributions to the PLR using the method of silent substitution have yielded contrasting results, with one study reporting a contribution from M- and L-cones (Tsujimura et al., 2010), and another reporting a possible contribution from rod photoreceptors (Vie´not et al., 2010). Melanopsin and rod–cone contributions to the PLR are difficult to assess in normally sighted humans due to overlap of spectral sensitivity for the various photoreceptor types. As demonstrated in macaques, which have trichromatic vision similar to humans, melanopsin-dependent pupillary responses can be examined in isolation when rod– cone signaling is disrupted (Gamlin et al., 2007). Hence, the role of melanopsin versus rod– cone photoreceptors in driving pupillary light responses could potentially be assessed in blind humans with complete loss of visual function, but with preservation of the retinal ganglion cell layer and melanopsin function (Czeisler et al., 1995; Klerman et al., 2002; Zaidi et al., 2007). To date, however, fewer than a dozen such patients have been identified worldwide. In the present study, we provide a detailed analysis of pupillary light responses in a patient with intact nonvisual responses to light (Zaidi et al., 2007), but without a functional outer retina. Here, the relative contribution of melanopsin and visual photoreceptors was assessed by comparing PLR responses in the totally visually blind patient with normally sighted individuals. Millions of individuals habitually expose themselves to room light in the hours before bedtime, yet the effects of this behavior on melatonin signaling are not well recognized. We tested the hypothesis that exposure to room light in the late evening suppresses the onset of melatonin synthesis and shortens the duration of melatonin production. In a retrospective analysis, we compared daily melatonin profiles in individuals living in room light (<200 lux) vs. dim light (<3 lux). Healthy volunteers (n = 116, 18–30 yr) were recruited from the general population to participate in one of two studies. Participants lived in a General Clinical Research Center for at least five consecutive days. Individuals were exposed to room light or dim light in the 8 h preceding bedtime. Melatonin duration, onset and offset, suppression, and phase angle of entrainment were determined. Compared with dim light, exposure to room light before bedtime suppressed melatonin, resulting in a later melatonin onset in 99.0% of individuals and shortening melatonin duration by about 90 min. Also, exposure to room light during the usual hours of sleep suppressed melatonin by greater than 50% in most (85%) trials. These findings indicate that room light exerts a profound suppressive effect on melatonin levels and shortens the body’s internal representation of night duration. Hence, chronically exposing oneself to electrical lighting in the late evening disrupts melatonin signaling and could therefore potentially impact sleep, thermoregulation, blood pressure, and glucose homeostasis. The perception of migraine headache, which is mediated by nociceptive signals transmitted from the cranial dura mater to the brain, is uniquely exacerbated by exposure to light. Here we show that exacerbation of migraine headache by light is prevalent among blind persons who maintain non-image-forming photoregulation in the face of massive rod/cone degeneration. Using single-unit recording and neural tract-tracing in the rat, we identified dura-sensitive neurons in the posterior thalamus, whose activity was distinctly modulated by light, and whose axons projected extensively across layers I through V of somatosensory, visual and associative cortices. The cell bodies and dendrites of such dura/light-sensitive neurons were apposed by axons originating from retinal ganglion cells, predominantly from intrinsically-photosensitive retinal ganglion cells – the principle conduit of non-image-forming photoregulation. We propose that photoregulation of migraine headache is exerted by a non-image-forming retinal pathway that modulates the activity of dura-sensitive thalamocortical neurons. Migraine is a recurring, episodic neurological disorder characterized as a unilateral, throbbing headache that is commonly associated with a variety of other symptoms (e.g., nausea, vomiting, irritability, fatigue). Migraine pain is thought to originate from chemical irritation of the meninges, which leads to transmission of nociceptive signals from the dura mater to the brain via the so-called trigeminovascular pathway. The first- and second-order neurons in this pathway are, respectively, sensory neurons in the trigeminal ganglion that project centrally to the spinal trigeminal nucleus (SpV), and dura-sensitive neurons in laminae I and V of SpV that project to the posterior thalamus. Prolonged neuronal activation during a migraine attack is thought to induce peripheral and central sensitization along the trigeminovascular pathway, which explains the throbbing of headache and the accompanying scalp and neck-muscle tenderness, and whole-body cutaneous allodynia. The pupillary light reflex (PLR) is a reflex that controls the diameter of the pupil, in response to the intensity (luminance) of light that falls on the retina of the pupil and the eye, thereby assisting in adaptation to various levels of lightness/darkness. A greater intensity of light causes the pupil to constrict (miosis/myosis) (allowing less light in), whereas a lower intensity of light causes the pupil to dilate (mydriasis,expansion) (allowing more light in). Thus, the pupillary light reflex regulates the intensity of light entering the eye. The pupillary light reflex pathway has an afferent limb (CN II) and efferent limb (CN III). The ganglion cells of the retina project bilaterally to the pretectal nuclei. The pretectal nuclei projects crossed and uncrossed fibers to the Edinger-Westphal nucleus, which gives rise to the preganglionic parasympathetic fibers. These fibers exit the midbrain with CN III and synapse with postganglionic parasympathetic neurons of the ciliary ganglion, which innervates the sphincter muscle of the iris. Michel Siffre - scientist based in Paris, author of several books, including Beyond Time (McGraw-Hill, 1964) and Découvertes dans les grottes mayas (Arthaud, 1993). Joshua Foer - freelance science writer. found the field of human chronobiology. Joshua Foer interviewed Siffre by email. Whole study on this link. Descriptions of the pineal gland date back to antiquity, but its functions in humans are still poorly understood. In both diurnal and nocturnal vertebrates, its main product, the hormone melatonin, is synthesized and released in rhythmic fashion, during the dark portion of the day–night cycle. Melatonin production is controlled by an endogenous circadian timing system and is also suppressed by light. In lower vertebrates, the pineal gland is photosensitive, and is the site of a self-sustaining circadian clock. In mammals, including humans, the gland has lost direct photosensitivity, but responds to light via a multisynaptic pathway that includes a subset of retinal ganglion cells containing the newly discovered photopigment, melanopsin. The mammalian pineal also shows circadian oscillations, but these damp out within a few days in the absence of input from the primary circadian pacemaker in the suprachiasmatic nuclei (SCN). The duration of the nocturnal melatonin secretory episode increases with nighttime duration, thereby providing an internal calendar that regulates seasonal cycles in reproduction and other functions in photoperiodic species. Although humans are not considered photoperiodic, the occurrence of seasonal affective disorder (SAD) and its successful treatment with light suggest that they have retained some photoperiodic responsiveness. In humans, exogenous melatonin has a soporific effect, but only when administered during the day or early evening, when endogenous levels are low. Some types of primary insomnia have been attributed to diminished melatonin production, particularly in the elderly, but evidence of a causal link is still inconclusive. Melatonin administration also has mild hypothermic and hypotensive effects. A role for the pineal in human reproduction was initially hypothesized on the basis of clinical observations on the effects of pineal tumors on sexual development. More recent data showing an association between endogenous melatonin levels and the onset of puberty, as well as observations of elevated melatonin levels in both men and women with hypogonadism and/or infertility are consistent with such a hypothesis, but a regulatory role of melatonin has yet to be established conclusively. A rapidly expanding literature attests to the involvement of melatonin in immune function, with high levels promoting and low levels suppressing a number of immune system parameters. The detection of melatonin receptors in various lymphoid organs and in lymphocytes suggests multiple mechanisms of action. Melatonin has been shown to be a powerful antioxidant, and has oncostatic properties as well, both direct and indirect, the latter mediated by its effects on reproductive hormones. Finally, there are reports of abnormal daily melatonin profiles in a number of psychiatric and neurological disorders, but the significance of such abnormalities is far from clear. Critically ill patients are known to suffer from severely fragmented sleep with a predominance of stage I sleep and a paucity of slow wave and REM sleep. The causes of this sleep disruption include the intensive care unit (ICU) environment, medical illness, psychological stress, and many of the medications and other treatments used to help those who are critically ill. The clinical importance of this type of sleep disruption in critically ill patients, however, is not known. This article reviews the literature on sleep disruption in the ICU, the effects of sepsis on sleep, the effects of commonly used ICU medications on sleep, the relationship between sleep and sedation, and the literature on the biological and psychological consequences of sleep deprivation specifically as it relates to the critically ill. Finally, an integrative approach to improving sleep in the ICU is described. Dr. Dustin M. Graham was born and raised in Pleasanton, California and received his Ph.D. in neuroscience from Brown University. He began his research career at Santa Clara University in the lab of Dr. David Tauck, studying neural pathways of learning and memory in the pond snail Lymnaea stagnalis. His interests turned to the retina while working with Dr. Ralph Nelson at the National Institutes of Health. There he helped develop a rapid labeling technique to delineate morphological subtypes of retinal neurons in zebrafish. As a graduate student, Dustin studied mammalian circadian rhythms and the newly discovered melanopsin ganglion cell activity in Dr. David Berson’s lab. He focussed on the phototransduction cascade in ipRGCs, and developed a dissociation and culturing procedure to identify and record light responses from isolated ipRGCs. Dustin is currently a post-doctoral research fellow in the Psychology department at the University of Virginia where he studies development and synaptic mechanisms of the gustatory system in rats. For the greater part of 150 years it was assumed that the mammalian retina contained only two types of photoreceptors; rods and cones. However, a flurry of recent evidence has demonstrated the existence of a third type of mammalian photoreceptor that differs greatly from rods and cones. This type utilizes a different photopigment, is much less sensitive to light, and has far less spatial resolution; characteristics that fit perfectly with this photoreceptor’s primary function of signaling changes in ambient light levels to the brain throughout the day. Most surprisingly, these photoreceptors are ganglion cells, and thus, have the unique ability to communicate directly with the brain. These intrinsically photosensitive retinal ganglion cells (ipRGCs) are a rare sub-population of ganglion cells (1-3%) whose primary role is to signal light for unconscious visual reflexes, such as pupillary constriction, and regulating a number of daily behavioral and physiological rhythms, collectively called circadian rhythms. This latter process, which adjusts circadian rhythms to the light/dark cycle of an animal’s environment, is known as photoentrainment. The visual behaviors under ipRGC control are remarkably tonic, and require long integration times of ambient light levels. The unique properties of ipRGCs, both functionally and anatomically, make them well suited for regulating such behaviors. In the human, cone photoreceptors (L, M, and S) and the melanopsincontaining, intrinsically photosensitive retinal ganglion cells (ipRGCs) are active at daytime light intensities. Signals from cones are combined both additively and in opposition to create the perception of overall light and color. Similar mechanisms seem to be at work in the control of the pupil’s response to light. Uncharacterized however, is the relative contribution of melanopsin and S cones, with their overlapping, short-wavelength spectral sensitivities. We measured the response of the human pupil to the separate stimulation of the cones and melanopsin at a range of temporal frequencies under photopic conditions. The S-cone and melanopsin photoreceptor channels were found to be low-pass, in contrast to a band-pass response of the pupil to L- and M-cone signals. An examination of the phase relationships of the evoked responses revealed that melanopsin signals add with signals from L and M cones but are opposed by signals from S cones in control of the pupil. The opposition of the S cones is revealed in a seemingly paradoxical dilation of the pupil to greater S-cone photon capture. This surprising result is explained by the neurophysiological properties of ipRGCs found in animal studies. NIGMS is a part of the National Institutes of Health that supports basic research to increase our understanding of biological processes and lay the foundation for advances in disease diagnosis, treatment and prevention. Circadian rhythms are physical, mental and behavioral changes that follow a roughly 24-hour cycle, responding primarily to light and darkness in an organism’s environment. They are found in most living things, including animals, plants and many tiny microbes. The study of circadian rhythms is called chronobiology. Are circadian rhythms the same thing as biological clocks? No, but they are related. Our biological clocks drive our circadian rhythms. The biological clocks that control circadian rhythms are groupings of interacting molecules in cells throughout the body. A „master clock“ in the brain coordinates all the body clocks so that they are in synch. What is the master clock? Sleep and circadian disturbances and disorders affect millions of Americans across all demographic groups. An estimated 25-30% of the general adult population, and a comparable percentage of children and adolescents, is affected by decrements in sleep health that are proven contributors to disability, morbidity, and mortality. As a result, sleep and circadian disturbances and disorders have been recognized by Congress and the Department of Health and Human Services1,2 as high priority targets for basic and clinical scientific investigation. Three general categories of sleep and circadian disorders and disturbances have been described: 1) disorders of sleep and circadian rhythms; 2) sleep deficiency; and 3) environmental disruption of circadian functions. In addition to clinical sleep and circadian disorders, sleep deficiency and circadian disruption resulting from lifestyle factors are increasingly common societal problems that increase disease risk through complex pathways. Advances sweeping across the spectrum of biomedical inquiry have transformed the sleep and circadian research landscape since the first NIH Sleep Disorders Research Plan was developed in 1996. The scientific domain is well-poised today to contribute knowledge advances and emerging technologies to the goals of understanding mechanisms of disease risk, accelerating translation from bench to bedside to community, and developing the evidence based evaluation of intervention effectiveness. Opportunities for research training exist in all areas of sleep and circadian biology and at multiple levels of the educational ladder. Scientific cross-fertilization and the development of an interdisciplinary workforce would stimulate the application of sleep and circadian scientific advances in cross-cutting domains. Building on scientific advances that link sleep problems to health and safety risks, the National Institutes of Health today released the 2011 NIH Sleep Disorders Research Plan. The plan identifies research opportunities to be pursued over the next three to five years in order to spur new approaches to the prevention and treatment of sleep disorders. Recommended research initiatives include looking at the connection between sleep and circadian systems (the body’s natural 24-hour cycle), studying the influence of genetic and environmental factors that could influence a person’s sleep health, and conducting more comparative effectiveness trials to improve treatments for sleep and circadian disorders. March 7–13, 2011 March 7–13, 2011, is National Sleep Awareness Week. Sleep impairment is linked as a contributing factor to motor vehicle crashes, industrial disasters, and medical and other occupational errors (1). Persons experiencing sleep insufficiency are more likely to have chronic diseases such as cardiovascular disease, diabetes, depression, or obesity (2,3). In 2008, approximately 28% of surveyed adults in the United States reported frequent insufficient sleep (≥14 days in the past 30 days) (4), which has been associated with fair/poor general health, frequent mental and physical distress, depressive symptoms, anxiety, and pain (3). Sleep insufficiency and poor sleep quality also can result from sleep disorders such as chronic insomnia, restless legs syndrome, sleep apnea, or narcolepsy (1). The National Sleep Foundation suggests that healthy adults need 7–9 hours of sleep per day, and school-age children might require 10–11 hours of sleep (5). Additional information regarding the public health importance of sleep is available at http://www.cdc.gov/sleep. Information regarding sleep health and safety is available from the National Sleep Foundation at http://www.sleepfoundation.org. 12 States, 2009 An estimated 50–70 million adults in the United States have chronic sleep and wakefulness disorders (1). Sleep difficulties, some of which are preventable, are associated with chronic diseases, mental disorders, health-risk behaviors, limitations of daily functioning, injury, and mortality (1,2). The National Sleep Foundation suggests that most adults need 7–9 hours of sleep per night, although individual variations exist. To assess the prevalence and distribution of selected sleep difficulties and behaviors, CDC analyzed data from a new sleep module added to the Behavioral Risk Factor Surveillance System (BRFSS) in 2009. This report summarizes the results of that analysis, which determined that, among 74,571 adult respondents in 12 states, 35.3% reported having <7 hours of sleep on average during a 24-hour period, 48.0% reported snoring, 37.9% reported unintentionally falling asleep during the day at least 1 day in the preceding 30 days, and 4.7% reported nodding off or falling asleep while driving in the preceding 30 days. Continued public health surveillance of sleep quality, duration, behaviors, and disorders is needed to understand and address sleep difficulties and their impact on health. As a first step, a multifaceted approach that includes increased public awareness and education and training in sleep medicine for appropriate health-care professionals is needed; however, broad societal factors, including technology use and work policies, also must be considered. David Blask, PhD, MD (Tulane University School of Medicine); George Brainard, PhD (Jefferson Medical College); Ronald Gibbons, PhD (Virginia Tech); Steven Lockley, PhD (Brigham and Women’s Hospital, Harvard Medical School); Richard Stevens, PhD (University Connecticut Health Center); and Mario Motta, MD (CSAPH, Tufts Medical School). Objective. To evaluate the impact of artificial lighting on human health, primarily through disruption of circadian biological rhythms or sleep, as well as the impact of headlamps, nighttime lighting schemes, and glare on driving safety. Concerns related to energy cost, effects on wildlife and vegetation, and esthetics also are briefly noted. Methods. English-language reports in humans were selected from a PubMed search of the literature from 1995 to March 2012 using the MeSH terms “circadian/biological clocks/rhythm,” “chronobiology/disorders,” “photoperiod,” “light/lighting” “sleep,” “work schedule,” or “adaptation,” combined with the terms “physiology,” “melatonin,” “adverse effects/toxicity,” “pathophysiology,” “neoplasm,” “epidemiology/etiology,” “mental disorders,” “energy metabolism,” and “gene expression.” Additional articles were identified by manual review of the references cited in these publications; others were supplied by experts in the field who contributed to this report (see Acknowledgement). Results. Biological adaptation to the sun has evolved over billions of years. The power to artificially override the natural cycle of light and dark is a recent event and represents a man-made self-experiment on the effects of exposure to increasingly bright light during the night as human societies acquire technology and expand industry. In addition to resetting the circadian pacemaker, light also stimulates additional neuroendocrine and neurobehavioral responses including suppression of melatonin release from the pineal gland improving alertness and performance. Low levels of illuminance in the blue or white fluorescent spectrum disrupt melatonin secretion. The primary human concerns with nighttime lighting include disability glare (which affects driving and pedestrian safety) and various health effects. Among the latter are potential carcinogenic effects related to melatonin suppression, especially breast cancer. Other diseases that may be exacerbated by circadian disruption include obesity, diabetes, depression and mood disorders, and reproductive problems. Action of the AMA House of Delegates 2012 Annual Meeting: Council on Science and Public Health Report 4 Recommendations Adopted as Amended, and Remainder of Report filed. Current AMA Policy H-135.937 (AMA Policy Database) advocates for light pollution control and reduced glare from (electric) artifical light sources to both protect public safety and conserve energy. Lighting the night has become a necessity in many areas of the world to enhance commerce, promote social activity, and enhance public safety. However, an emerging consensus has come to acknowledge the effects of widespread nighttime artificial lighting, including the: 1) impact of artificial lighting on human health, primarily through disruption of circadian biological rhythms or sleep; 2) intersection of ocular physiology, vehicle headlamps, nighttime lighting schemes, and harmful glare; 3) energy cost of wasted and unnecessary electric light; and 4) impact of novel light at night on wildlife and vegetation. In addition to these health and environmental effects, an esthetic deficit is apparent with the progressive loss of the starry night sky and interference with astronomical observations. With the assistance of experts in the field, this report evaluates the effects of pervasive nighttime lighting on human health and performance. Concerns related to energy cost, effects on wildlife and vegetation, and esthetics are also briefly noted. English-language reports in humans were selected from a PubMed search of the literature from 1995 to March 2012 using the MeSH terms “circadian/biological clocks/rhythm,” “chronobiology/disorders,” “photoperiod,” “light/lighting” “sleep,” “work schedule,” or “adaptation,” combined with the terms “physiology,” “melatonin,” “adverse effects/toxicity,” “pathophysiology,” “neoplasm,” “epidemiology/etiology,” “mental disorders,” “energy metabolism,” and “gene expression.” Additional articles were identified by manual review of the references cited in these publications; others were supplied by experts in the field who contributed to this report (see Acknowledgement). The solar cycle of light and dark provides the essential basis for life on Earth. Adaptation to the solar cycle has resulted in fundamental molecular and genetic endogenous processes in virtually all life forms that are aligned with an approximately 24-hour period (circadian biological rhythm). The circadian genetic clock mechanism is intimately involved in many, if not most, facets of cellular and organismal function.1 Although the circadian system spontaneously generates near-24- hour rhythms, this master clock must be reset daily by the light-dark cycle to maintain proper temporal alignment with the environment. 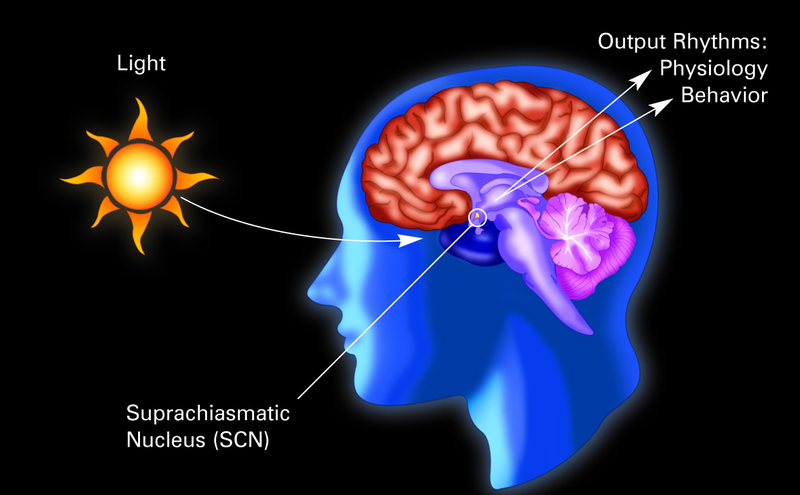 In humans and other mammals, this daily entrainment is achieved primarily by novel photoreceptors that project directly to the site of the circadian clock (suprachiasmatic nuclei (SCN) of the hypothalamus). 2-5 The tandem development of an endogenous rhythm sensitive to light presumably evolved to allow for precise 24-hour regulation of rest and activity, and for adapting to seasonal changes in night-length, while maintaining the advantages of an underlying physiology that anticipates day and night. Understanding the molecular and physiological basis of endogenous rhythms, how light information is communicated, and the health implications of disruptions to this system are topics of intensive study. Extensive nighttime lighting is required for contemporary society and commerce. Therefore, it is imperative to evaluate the unintended adverse health consequences of electric lighting practices in the human environment, and determine their physiological bases so that effective interventions can be developed to mitigate harmful effects of suboptimal light exposure. For example, engineers have already developed less disruptive night lighting technologies, and continued progress in this area is anticipated. That such technologies exist, however, does not guarantee that they will be purchased, installed and properly implemented. The medical community and public can take the lead on advocating a healthier environment, as illustrated by recent changes in public smoking policies worldwide. As the research on the biology of circadian rhythms has advanced, the range of potential disease connections due to disrupted circadian rhythms and sleep has expanded. In general, photobiological responses to light are not all-or-none phenomena. In the case of acutely suppressing high nighttime levels of melatonin or phase-shifting the entire melatonin rhythm, light works in a dose-response fashion. Once threshold is exceeded, increasing irradiances of light elicit increasing acute plasma melatonin suppression or longer-term phase-shifts of the melatonin rhythm in healthy individuals. 16,18,27 All humans, however, are not equally sensitive to light; significant individual differences exist in sensitivity to light for both neuroendocrine and circadian regulation.16,18 For a detailed description of the molecular and cellular basis for how photoreceptive input regulates circadian and neuroendocrine system function, see the Addendum. Glare from nighttime lighting can create hazards ranging from discomfort to frank visual disability. Disability glare has been fairly well-defined based on the physiology of the human eye and behavior of light as it enters the ocular media. Discomfort glare is less well-defined and more subjective as it is not based on a physical response per se but rather a psychological response. Accordingly, the respective bases of (and research into) these two responses are fundamentally different. Disability glare is unwanted and poorly directed light that temporarily blinds, causes poor vision by decreasing contrast, and creates an unsafe viewing condition, especially at night, by limiting the ability of the person to see. There are natural causes of disability glare, such as solar glare at sunset on a dirty windshield which can be lessened by cleaning the windshield. Unfortunately, nighttime glare while driving is not easily remedied. It is caused by the misapplication of luminaires that comprise the lighting design which are generally overly bright and unshielded, and/or sources of poorly directed light that enters the eye and scatters among ocular structures resulting in diminished contrast and impeded vision. Such effects dramatically worsen as the human eye ages, contributing to poor night vision and difficulty in driving at night for older drivers. Disability glare is caused by light scatter from ocular media.28 As light enters the eye, it collides with cornea, lens, and vitreous humor, scattering photons and casting a veil of light across the retina29-31 (see Figure 1). The veil of light reduces the contrast of the object that the driver is trying to see, having the same effect as increasing the background luminance of the object. This veiling light is represented by the term veiling luminance. Veiling luminance is directly related to the illuminance of the light source and inversely related to the square of the angle of eccentricity of the light source with an age dependent multiplier across the entire equation.28 This means that the disability from a light source is lessened the farther the source is from the line of sight.α α As an example, high mast lighting systems where the roadway lighting is over 100 feet in the air have significantly less glare than traditional systems, which are typically located 30−50 feet in the air. Because of Accordingly, proper design techniques and consideration for the glare caused by lighting systems need to be considered. One of the primary difficulties, especially for roadways, is that the lighting is not governed by a single jurisdiction. Roadway lighting may be designed properly and provide a low level of glare; however lighting can emanate from adjacent properties, spilling out into the roadway thus affecting the driver and overall performance and suitability of a lighting system. Control over all environmental sources of nighttime lighting is therefore critical for the overall control of disability glare. Both overhead roadway lighting and opposing headlamps are involved with discomfort glare in the driver. A numerical rating scale based on the dynamic nature of glare in simulations is available to measure the discomfort level experienced by drivers (Appendix). 33 The overall impact of discomfort glare on fatigue and driver safety remains an issue. Lighting and Glare. Both discomfort and disability glare have specific impacts on the user in the nighttime environment. Research has shown that both of these glare effects occur simultaneously. Research also shows that the effects of the glare are cumulative, meaning that the glare from two light sources is the sum of the glare from the individual light sources. As a result, every light source within the field of view has an impact on the comfort and visual capability of the driver. For overhead roadway lighting, design standards include a methodology for controlling the disability glare through a ratio of the eye adaptation luminance to the veiling luminance caused by the light source. As the veiling luminance is related to the illuminance the light source produces at the eye, a roadway luminaire that directs light horizontally has a much greater effect on the driver than a light source that cuts off the horizontal light. A trend towards flat glass luminaires, which provide a cut off of light at horizontal angles, provides a lower level of both disability and discomfort glare. Decorative luminaires (e.g., acorn or drop lens) have a high level of horizontal light and typically are used in areas where pedestrians are the primary roadway users. The horizontal light in this situation is useful for facial recognition of a pedestrian, but it limits the driver’s ability to perceive other objects in the roadway. As a result, many cities are designing and installing two lighting systems, one for the pedestrian and one for the roadway. Luminaires employing solid state technologies and light-emitting diodes (LED) provide light from an array of small sources rather than a single large source. These designs either rely on each small source to provide a component of the light distribution, or the components of the lighting array provide individual luminating fields of the light distribution. In the first instance, the arrays are the inverse squared relationship, a high mast system reduces glare by 75% compared with a traditional system. typically flat and have an optic to provide the light distribution; if a single LED fails, the others still provide the light distribution. In the second method, the components of the array are aimed to different areas of the beam distribution. This approach typically results in light aimed at the driver and pedestrians causing a higher glare impact. The other issue with the multiple sources used in LED luminaires is that each of the sources typically has a very high luminance itself as the source is very small and very bright; in the absence of sufficient diffusion, they cause significant glare. Accordingly, solid state lighting systems typically have a higher glare impact than traditional sources. In order to minimize the glare impact, headlamps are designed with lower left side light intensity than the right side. This reduces the glare to an opposing vehicle but does not eliminate it. New technologies such as turning headlamps and headlamps that hide part of the headlamp beam when a vehicle passes are possible solutions for this issue. With the advent of high intensity discharge Xenon headlamps and LED-based technologies, the glare issue has become more serious. While the intensity towards a driver is limited, the small but brighter source generates a much higher impression of glare than traditional technologies. These “blue” headlamp sources have a higher complaint rate for glare than for any other light source. Adult, and especially elderly drivers, experience increased glare sensitivity, and elderly drivers may not be able to sufficiently fulfill the criteria for night driving ability because of contrast and glare sensitivity. Prospective studies indicate that reduction in the useful field of view, visual field loss, and glare sensitivity increase crash risk in older drivers.37,38 Crash risk begins to increase around age 50 years of age and continues to increase with aging. 39 No studies have explicitly compared traffic accident rates under different highway lighting conditions. Epidemiological studies are a critical component of the evidence base required to assess whether or not light exposure at night affects disease risk, including cancer. These studies, however, are necessarily observational and can rarely provide mechanistic understanding of the associations observed. Carefully designed and controlled basic laboratory studies in experimental animal models have the potential to provide the empiric support for a causal nexus between light exposure at night and biological/health effects and to help establish plausible mechanisms. One area of considerable study on the possible effects of nighttime light exposure involves cancer. More recent work has focused on the ability of light at night to promote the growth progression and metabolism in human breast cancer xenografts. Nocturnal melatonin suppresses the growth of both estrogen receptor negative (ER-) and estrogen receptor positive (ER+) human breast cancer xenografts; the essential polyunsaturated fatty acid, linoleic acid is necessary for the growth of such (ER-) tumors, and its metabolism can be used as a biomarker of cellular growth. 52-55 Exposure of rats with such cancer xenografts to increasing intensities of white, fluorescent polychromatic light during the 12 hour dark phase of each daily cycle results in a dose-dependent suppression of peak nocturnal serum melatonin levels and a corresponding marked increase in tumor metabolism of linoleic acid and the rate of tumor growth. Exposure to even the very dimmest intensity of light during the night (0.2 lux) suppressed the nocturnal peak of circulating melatonin by 65% and was associated with marked stimulation in the rates of tumor growth and linoleic acid metabolic activity. In this model, measurable effects on xenograft growth and linoleic acid metabolism were apparent with 15% suppression in nocturnal melatonin levels. While the experimental evidence from rodent cancer models links disruption of circadian rhythms and circulating melatonin concentrations (inversely) with progression of disease, the human evidence is indirect and based on epidemiological studies. Breast cancer has received the most study. Each of these studies has strengths and limitations common to epidemiology, particularly in exposure assessment and appropriate comparison groups (e.g., no woman in the modern world is unexposed to light-at-night, but quantifying that exposure is difficult). Although shiftwork represents the most extreme example of exposure to light at night and circadian disruption, perturbation of circadian rhythms and the melatonin signal is also experienced by nonshift workers with a normal sleep/wake-cycle.12 Anyone exposing themselves to light after dusk or before dawn is overriding the natural light-dark exposure pattern as noted in the earlier discussion on measures of illumination. After lights out for bedtime, it is not yet clear whether the ambient background light from weak sources in the bedroom or outside light coming through the window could influence the circadian system; a brief exposure at these levels may not have a detectable impact in a laboratory setting, although long-term chronic exposure might. Four case-control studies have now reported an association of some aspect of nighttime light level in the bedroom with breast cancer risk. 82-85 The elevated risk estimate was statistically significant in two of them.83,85 As case-control designs, in addition to the limitation of recall error, there is also the potentially significant limitation of recall bias. Light during the night will disrupt circadian function as well as sleep, and the health consequences of short sleep and of chronic circadian disruption are being intensively investigated. 97 A growing number of observational and clinical studies on sleep and metabolism suggest short sleep periods have substantial harmful effects on health; however, it is not yet clear that sleep and dark have been entirely disentangled in these studies.97,98 For example, in one study, sleep duration (verified by polysomnography) was associated with morning blood levels of leptin, a hormone that plays a key role in energy expenditure and appetite. 99 However, the duration of typical sleep reported by each subject was more strongly associated with leptin concentrations. Mean verified sleep was 6.2 hours, whereas mean reported sleep was 7.2 hours. Reported “sleep duration” probably reflects the time from when a person turns out their light for bed and falls asleep and when they get up in the morning (i.e., actual hours of dark exposure). An important question is to determine what portion of the health effects of dark disruption is due to sleep disruption and what portion is due directly to circadian impact of electric light intrusion on the dark of night. Media use at night (i.e., televisions, computer monitors, cell phone screens) negatively affects the sleep patterns of children and adolescents and suppresses melatonin concentrations. 100-102 The American Academy of Pediatrics recommends removing televisions and computers from bedrooms to assist in limiting total “screen time” on a daily basis. 101 This action also may help in improving sleep patterns. Electric lighting accounts for about 19% of electricity consumption worldwide and costs about $360 billion.103 Much of the light that is produced is wasted, for example, by radiating light into space away from the task or environment intended to be illuminated. Estimates of how much is wasted vary; one estimate from the International Dark-Sky Association is 30% in the United States.104 Such a percentage worldwide would account for an annual cost of about $100 billion. Although not directly under the purview of human health and disease, the following considerations are indirectly related to human well-being. Life on the planet has evolved to accommodate the 24-hour solar cycle of light and dark. Human imposition of light at night and disruption of the natural dark-light cycle represents a dramatic change to the environment. 108 Study of the effects of light at night on animal and plant life is in the early stages, but the entire spectrum of life, including animal, plant, insect, and aquatic species, may be affected. The natural 24-hour cycle of light and dark helps maintain precise alignment of circadian biological rhythms, the general activation of the central nervous system and various biological and cellular processes, and entrainment of melatonin release from the pineal gland. Pervasive use of nighttime lighting disrupts these endogenous processes and creates potentially harmful health effects and/or hazardous situations with varying degrees of harm. The latter includes the generation of glare from roadway, property, and other artificial lighting sources that can create unsafe driving conditions, especially for older drivers. Current AMA policy advocates that all future outdoor lighting be of energy efficient designs to reduce energy use and waste. Future streetlights should incorporate fully shielded or similar non-glare design to improve the safety of our roadways for all, but especially vision impaired and older drivers. More direct health effects of nighttime lighting may be attributable to disruption of the sleep-wake 5 cycle and suppression of melatonin release. Even low intensity nighttime light has the capability of suppressing melatonin release. In various laboratory models of cancer, melatonin serves as a circulating anticancer signal and suppresses tumor growth. Limited epidemiological studies support the hypothesis that nighttime lighting and/or repetitive disruption of circadian rhythms increases cancer risk; most attention in this arena has been devoted to breast cancer. The quality and duration of sleep and/or period of darkness affect many biological processes that are currently under investigation. Further information is required to evaluate the relative role of sleep versus the period of darkness in certain diseases or on mediators of certain chronic diseases or conditions including obesity. Due to the nearly ubiquitous exposure to light at inappropriate times relative to endogenous circadian rhythms, a need exists for further multidisciplinary research on occupational and environmental exposure to light-at-night, the risk of cancer, and exacerbation of chronic diseases. Do you read before bedtime ? Read on tablet without a blue light, which negatively affects the secretion of melatonin . Navštívíme Váš interiér a proměříme světelné zdroje. U měřených zdrojů sledujeme teplotu chromatičnosti, intenzitu, spektrální složení, CRI- věrnost podání barev. Vzhledem k naměřeným hodnotám vám doporučíme správné užívání stávajících svítidel, popřípadě vypracujeme návrh možných změn. Naše kurzy správného osvětlení jsou jedinečná možnost, jak se dozvědět v ucelené formě informace, které byste jinak hledali na internetu a v odborné literatuře velmi obtížně a dlouho. Kurz je určen pro všechny, kteří se chtějí dozvědět něco o správném osvětlení a použití světla. Pokud rekonstruujete nebo stavíte, neexistuje lepší způsob jak se dozvědět, podle čeho svítidla později vybírat. Error Please validate your fields.